A rat may have caused this week's power outage at Japan's tsunami-hit Fukushima nuclear power plant, says the Tokyo Electric Power Co (Tepco). The company suspects the rodent may have caused a short-circuit in a switchboard, triggering the power cut. "We have deeply worried the public, but the system has been restored," Tepco spokesman Masayuki Ono was quoted as saying by AFP news agency. Two years ago a massive quake-triggered tsunami caused meltdowns at the plant. The plant was brought under control in December 2011 and Monday's crisis was the first time since then that so many facilities had been affected by electrical failure at the same time, Tepco admits. The power cut shut down cooling systems for four spent fuel ponds at reactors 1, 3 and 4 on Monday evening, although cooling to the reactors themselves was not affected. The system cooling water which contained spent - but still highly radioactive - nuclear fuel rods failed and it took engineers some 30 hours to repair the damage. All cooling systems were operational by early Wednesday morning, Tepco said. It said it found burn marks on a makeshift power switchboard and a 15cm (six-inch) dead animal nearby. 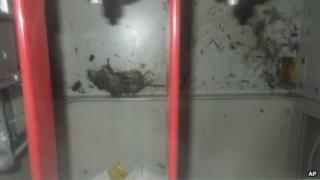 The company released an image of an apparent rodent carcass inside the switchboard unit. Correspondents say the incident has highlighted the fragility of the rescue operation at Fukushima two years after the meltdowns caused a major release of radiation. The Japanese government insists that the reactors are in a "cold shutdown" state and no longer releasing high levels of radiation. But company officials admit they are still using makeshift power systems as they struggle to decommission - or shut down - down the facility, a process expected to take decades.